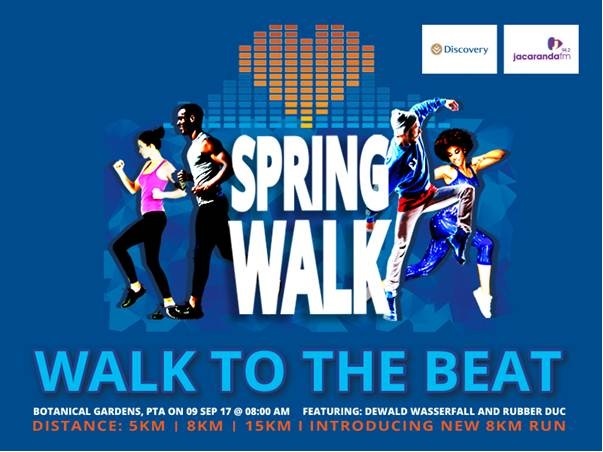 'Walk to the Beat' and welcome spring at the Discovery Jacaranda FM annual Spring Walk. It promises to be a fun-filled day of activity and music you won't want to miss! For the past six years, this much-loved race has been kicking off spring in the Capital. The Discovery Jacaranda FM Spring Walk is back again this year to help shake off the winter blues and get people active while enjoying the best entertainment. The event takes place on Saturday, 9 September, from 8am, at the scenic Pretoria National Botanical Gardens. After the race, Spring Walkers will be able to enjoy live performances by top SA artists Rubber Duc and Dewald Wasserfall. With four courses to choose from, there is a distance for everyone: 5km, 8km and 15km walks, and this year’s new addition of an 8km run for those who want a more intense workout. All routes are also wheelchair friendly. “We are really excited about this year’s Spring Walk which was launched by our new breakfast show, Martin Bester and Tumi Morake. It’s a perfect way for people to keep fit whilst meeting our talented on-air celebrities and presenters. The event has something for everyone with the Spar kiddies area, plenty of children’s entertainment and no one will go hungry, with food trucks serving up deliciousness all day,” said Jacaranda FM station Marketing Manager Minisha Patel. “There will also be big screens for die-hard rugby fans to watch every moment of the Rugby Championship clash between Australia and the Springboks,” Patel added. Discovery’s Head of Sponsorships and Experiential Marketing, Iona Maclean, said the partnership with Jacaranda FM was a perfect fit for Discovery, as it brought out the core values of both businesses. “Discovery promotes a healthy lifestyle for the whole family and Jacaranda FM is a family-focused radio station. Add great music and good entertainment to the menu and you get the perfect day that is certainly not to be missed, “said Maclean.